Steam traps are one of the most important components of a steam heating system. Steam traps must remove condensate, air, and CO2 from a heat transfer unit or the distribution piping system as fast as they accumulate. Condensate is simply water. Water is formed in the distribution system because of unavoidable heat losses. Water also forms in the heating equipment because of the heat transfer from the steam to the substance heated. All of the condensate must be removed from the distribution system and the heat transfer equipment. Condensate in the heat transfer unit takes up space and, in effect, reduces the physical size, and therefore the capacity of the equipment. Condensate must be removed promptly so the heat transfer unit (heating coil, radiator, heat exchanger, etc.) can be filled with steam. The distribution system needs to be drained as well as the heat transfer units. Condensate that is permitted to collect in pipes is blown into waves by steam passing over the condensate. Steam moves very fast in mains and supply lines. The waves will block steam flow at some point in a line. Condensation occurs after that point, causing a pressure differential that accelerates the slug of water, turning the slug into a battering ram when it encounters an ell, valve, orifice plate, etc., that can damage fittings of valves. This water hammer is not only annoying, but actually can be dangerous. Traps involve more than just water drainage. Air and CO2 must also be removed. Air is always present in a system on start-up, and is in boiler feed water. CO2 is released from dissolved carbonates in boiler feed water. Air is a wonderful insulator, however, it is undesirable in a steam heating system. As steam condenses, air “plates out” on heat exchanger surfaces. One-half of one percent by volume of air in steam reduces heat transfer efficiency by 50 percent! CO2 can dissolve in condensate to form carbonic acid that will eat pipes and equipment. 02 in air causes pitting and speeds corrosion. Condensate, air, and CO2 should be removed as quickly and completely as possible by a steam trap, and not allow steam to be wasted. A specific application may require a less efficient trap, but most of the time a trap that can accomplish all the requirements can be used. This Info-Tec will concentrate on selecting and sizing steam traps. It is beyond the scope of this article to fully discuss proper piping practices involving steam traps, although some mention will have to be made concerning piping; it is not definitive. The reader is alerted to the fact that the best trap, carefully selected, can give poor performance if carelessly installed. There is no such thing as a universal steam trap. Mechanical types consist of inverted bucket and float and thermostatic. Thermostatic types consist of balanced pressure, bimetal expansion, and liquid expansion styles. to be considered when making a choice. 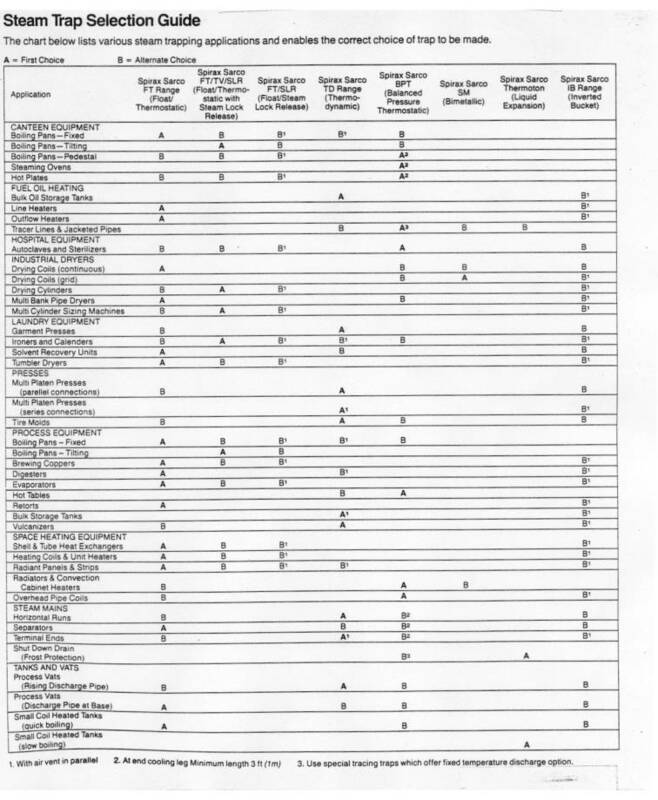 Figure 1 is a Sarco selection guide that is very comprehensive. It makes the basic selection of a trap very easy, but is only a starting point. To complete the selection, sizing must be considered, as well as location, and performance. Steam mains must always be trapped wherever condensate can collect. 4. Anywhere condensate will collect in low spots. This is true for supervised or automatic warm-up systems. The warm-up method will affect the size of traps for mains. Supervised warm-up is a method used where mains may only be warmed up once in a great while, even once in a lifetime, such as a power plant, where the boiler is only shut down for emergency maintenance. The initial warm-up is accomplished manually, hence “supervised warm-up”. These systems have manual valves open to atmosphere that are not closed until all the warm-up condensate has been discharged. Then the valves are closed, and traps take over the job of removing the condensate formed from the radiation load. Main line traps need not be sized to handle the warm-up load. Automatic warm-up is the method where the boiler is turned on without any supervision. There are no manual drainage valves. Traps therefore, have to handle the start-up condensate load. Regardless of the type of warm-up, collecting legs must be provided for the traps to effectively drain the main. Figure 1 indicates that the TD Sarco traps, thermo-dynamic disc type, are the best traps for all mains. While not “wrong”, the best trap also depends on the saturated steam pressure in the main. For steam pressures to 15 psig, an F & T trap is best. Over 15 psig, the thermo-dynamic trap is the better choice. The thermodynamic disk trap by Sarco is simplicity itself. It has only one moving part, a stainless steel disc. There is nothing to adjust. It works in any position, withstands waterhammer, freezing, and corrosive condensate. They are expensive. On start-up, incoming pressure raises disc A from its seat rings C. Air and cool condensate are instantly discharged through outlet B. Hot condensate releases flash steam as it flows through the trap. The high velocity of the flash steam creates a low-pressure area under the disc and draws it towards the seat. Pressure builds up in chamber D due to the impact of higher velocity flash steam against the cap. The flash steam pressure in chamber D forces the disc down against the pressure of the incoming fluid until it seats on inner ring C and closes the inlet. The disc also seats on the outer ring C, trapping pressure in chamber D.
In due course, condensation decreases the pressure in Chamber D. The disc is raised by incoming pressure. The cycle repeats. Disc traps “click” audibly when operating. This should be taken into consideration when using disc traps, as the noise could be objectionable. A trap cannot discharge condensate unless a DP exists across the trap. This is the reason for collecting legs. They provide a hydraulic head. The length and size of collecting legs for supervised warm-up should be the same size diameter as the main, never less than one pipe size smaller. The length should not be less than 8 inches long. For automatic warm-up systems, the collecting leg diameter should be calculated the same as on supervised systems, but the minimum length is 28 inches. The 28 inches insures a one-pound head is always at the trap inlet (28" W.C. = 1 psig). When supervised warm-up is used to start a system, usually a lot of time is taken to slowly warm the system. This limits stresses on the piping and equipment. Since the condensate load is taken care of manually on start-up, traps on the main will be surprisingly small. Table I is used to find the radiation loss of the main to be able to calculate the condensate load to size the traps. Most supervised warm-up systems are large systems run at high pressure, so our example will be to find the condensate load for a system operating a 100 psig, with a 10" main, 400 feet long. From Table I, find the condensate load. Total load 51 x 4 = 204 Lbs./Hr./400 Ft.
To drain 400 Ft. of horizontal main, one or two traps could be used. If one trap is used, a trap with a capacity of 204 Lbs./Hr. at 100 psig can be selected and the safety factor calculated. A 3/8" or 1/2" TD-52 Sarco has a capacity of 370 Lbs./Hr. at 100 psig inlet pressure (page 67 of Sarco catalog). Minimum safety factor for this type of installation is 1.2, so the 1.8 safety factor is ample. Only one 3/8" or 1/2" TD-52 is required. Of course, if the 400 foot main is not horizontal and pitched properly, more traps may be required at low points or at other places where condensate could accumulate, as previously mentioned. Capacity calculations for each trap are then made for the length of main being drained by a trap. From Table II, find the warm-up load for 100 feet of 4" main at 0 psig 18.2 Lbs. 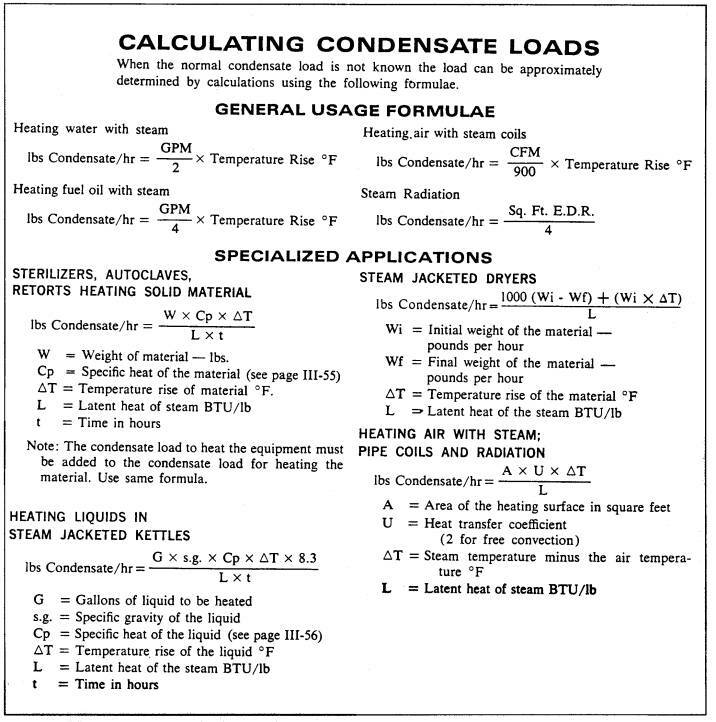 Calculate average rate of condensate: Pounds of condensate x 60 = Lbs./Hr. 13.6 x 60 = 54.4 Lbs./Hr. The calculated safety factor is more than ample since a factor of 2.5 is acceptable. Never go below a minimum safety factor of 1.5. There are many recommended safety factors for steam traps. Consideration is given to type of trap and usage. A rule of thumb is to use a factor of 2.5 on everything. Main traps on automatic warm-up systems have to be sized for the warm-up load. Therefore, depending on the size of the installation, this can result in an over-sized trap. Once the system is up to operating pressure, oversized traps can create problems. All traps wear rapidly on light loads. Discharge of small quantities of condensate at full pressure can pressurize the return piping system, creating problems. Installing smaller traps in parallel with the same aggregate capacity can alleviate these problems. Figure 2 shows a parallel installation using TD traps, but the traps could be F & T’s too. If the system only needed a single 1/2" or 3/4" trap, as in our example, nothing can be gained by parallel trapping. Parallel trapping is usually only considered on systems large enough to benefit from parallel trapping. One trap can be repaired while the other can stay in service. If one trap fails, the other can provide emergency service. Figure 3 shows various piping arrangements for steam trapping mains. Calculate the condensate load as accurately as possible. This calculation is the most important part of trap selection. If the condensate load in pounds per hour is not known, Figure 4 shows some common formulas to calculate the load. A rule of thumb to quickly calculate condensate load is: “1000 BTU’s in a pound of steam”. This is not exactly accurate, but is arithmetically easy to use for the calculations of load. (The actual statement should be: The latent heat of saturated steam at 0 psig is 970 BTU’s.) The pound referred to in the rule of thumb is not pressure but weight. A “pound” of steam condenses into a “pound” of water. 1. The maximum steam line pressure the heat exchange equipment can see. A trap must be selected with a rating equal to or greater than this pressure. 2. The actual pressure at the inlet to the trap. This will be less than the supply main pressure. The pressure at the trap will be the steam line pressure less the pressure drops through any control valves and the pressure drop through the piece of equipment. The capacity of the trap should be based on the estimated pressure at the trap inlet. 3. Any back pressure against which the trap must operate. The outlet of the trap may be lower than the return system and a “lift” is involved in getting the condensate to the return. The trap may be connected to a common piping system in which a static pressure may exist. Figure 5 shows the effect on capacity such backpressures can cause. As an example, if a trap with a 5-psig-inlet pressure has to discharge condensate into a return system that requires the condensate to be pushed up to a return line 5 feet higher than the trap outlet, the trap’s capacity will be cut almost 20 percent. A 6-foot water column equals 2.6 pounds of pressure. 2.6 psig is about 50 percent of the 5-psig-inlet pressure. Figure 5 shows this as a 20 percent reduction in trap capacity. Once the condensate load and pressure conditions are known, a trap can be selected. The type of trap can be selected from Figure 1. After applying a safety factor, the trap can be selected from manufacturer’s catalogs that will show capacities at various DP’s. The safety factor is the ratio of the maximum capacity of a steam trap and the load it is expected to handle. If the calculated maximum capacity a trap has to handle is 400 Lbs./Hr., and a safety factor of 2.5 to 1 is applied, a trap that can pass 1000 Lbs./Hr. is selected at the appropriate DP. As has been mentioned before, safety factors can vary from as little as 1.2 to as high as 4. The actual safety factor is very dependant on the accuracy of the calculations to find the condensate load. Often the needed information is not known and is “best guessed” at. The 2.5 to 1 safety factor used under these conditions should not result in a grossly oversized trap, but have enough safety factor so it certainly won’t be undersized. If the load calculations are deemed to be fairly accurate and price becomes a big factor, a safety factor of 2 should be adequate. Only if the load calculations are known to be accurate can lower safety factors be “safely” used. See Figure 6. A trap is needed for a steam unit heater. The only information available is that it is a “low pressure steam” system and the unit heater is “about 400,000 BTU’s”. From Figure 1, we see an F & T trap is the best choice. “Low pressure” steam is a steam pressure of 15 psig or less. The only thing we have to go on is the BTU rating of the heater, 400,000 BTU’s. 400,000 ÷ 1000 = 400 Lbs./Hr. condensate load. Applying a 2.5 safety factor, an F & T trap rated at 15 Lb. with a capacity rating of 1000 Lbs./Hr. at 1 Lb. DP is our selection; a Sarco FT15 - 1 1/4". A cooling leg of at least 28" in height must be installed before the inlet of the trap, and the trap must drain to atmospheric pressure 0 psig. A common application where sizing of a new trap needs to be done is when a steam to water heat exchanger is installed. Most heat exchangers have the steam flow controlled by a modulating temperature regulator. The F & T trap is a modulating trap and its use as best choice is confirmed by Figure 1. The condensing rate for any given heat exchanger is a complex problem. After a heat exchanger has been selected, the manufacturer of the exchanger should be consulted to get the condensing rate. Trap selection should handle the maximum load at 1/2 psig DP. This requires the trap to be piped at least 15 inches below the heat exchanger shell, and drain to 0 psig. Every effort should be made to drain to a gravity dry return line. The trap should have a safety factor of 2. Two is acceptable, since the condensing rate supplied by the manufacturer ought to be accurate. While F & T traps are the first or second choice in almost all situations, there are other traps. Other types of traps are more application specific. Balanced pressure thermostatic traps are primarily used on radiators, convectors, and fintube. The Sarco TA125 is a balanced pressure thermostatic trap. Thermostatic traps are wide open when cold. Consequently, they are self-draining, and resist freeze-up. When hot condensate reaches the element in the trap, the valve closes. At approximately 20°F below saturated steam temperature, the trap will open and discharge condensate. The element in the trap is self-adjusting over the entire pressure range. There are many configurations of thermostatic traps available. The most popular is the angle, union ended “radiator” trap. These traps are most often simply line-sized. Bimetallic traps are not often encountered. Their use is limited to applications that can utilize the sensible heat in condensate. Consequently, the unit being drained by bimetallic traps will partially flood before condensate is discharged at about 50°F below steam temperature. Liquid expansion thermostatic traps are another seldom used trap. The Sarco Thermoton is an example of this type of trap. Like the thermostatic trap, this type of trap is open on start-up. When the condensate reaches a predetermined setpoint below 212°F, the valve closes. The trap setpoint is adjustable. This feature permits use of sensible heat, but again results in flooding of the equipment being drained. The application must be able to tolerate this flooding. Because of the ability to adjust the temperature setting, this trap can be a very rough thermostatic temperature control. They are often used for freeze protection, when required, by draining other traps.